Note: this article is written for Holland Lops, but much of it applies to all breeds. So much of your success in show rabbbits depends on your start. Follow these tips to help you get off on the right foot! Step One: Go to a show. 1. Is showing rabbits something I would really enjoy? 2. Are Holland Lops the best breed for me? 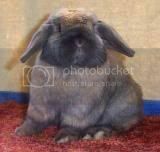 Now it is hard for me to believe that anyone would pick any other breed than a Holland Lop, but there are some considerations. First, Hollands aren’t the most docile breed. Look to Dutch or Himalayan for that. But neither are they known for biting or being overly problematic. Hollands are best for people who want a more curious, affectionate, but sometimes animated rabbit. Speaking of money, Hollands do cost more than many other breeds. That’s something to consider up front. If your budget is $25 per rabbit, choose another breed. I should note here, though, that Hollands have a long show career compared to other breeds. While some breeds show best for a matter of months, a good Holland buck may be competing well for five years. I know a buck that got his first Best of Breed at 7 months, and took a BRIS last weekend at almost 6 years of age. You can get your money’s worth out of a Holland. To learn how a rabbit show works, visit our section on rabbit shows. Now that you’ve decided that you do like showing rabbits as a hobby and Holland Lops as your breed, you should join the American Rabbit Breeders’ Association at www.arba.net. You will receive a manual on raising rabbits that is worth the small cost of joining. Also, once you have joined, you will be able to obtain registration certificates on your qualified Hollands. Read more about registering rabbits here. Likewise, you should also join the Holland Lop Rabbit Specialty Club, a national specialty club for our breed. You can contact them through www.hlrsc.com. Again, you will receive a manual, but this one is specific to Hollands. Read all you can, both from these manuals and on the internet. See our section on rabbit equipment for more information on what you need. Purchase a very few good quality rabbits from at least somewhat related lines. Get help from someone who has been successfully showing Hollands for awhile. Most of us purchased whatever rabbits were available because we were so excited we wanted to get started yesterday. We might luck up with some good stuff, but by and large, we will buy a lot of rabbits that we will re-sell in the not-too-distant future. Chances are, you will ignore this advice. Or think you are following it until the next nicer Holland becomes available. If you buy too much from too many lines and end up having to pare it down, don’t feel bad. That’s how most of us did it. Step Five: Show Your Foundation Stock. I waited until I had my first The Nature Trail’s rabbit before going to a show. I should have gone earlier and shown my brood stock. I would have learned more about what I was dealing with earlier on. Learning is the biggest goal in the beginning – even more important than producing winning rabbits. Now you are ready to breed rabbits, learn more about the details of conditioning, culling, dealing with problems, etc. You may want to join a local or regional club. You will learn how frequently you are able to show, budgeting your time and energy, and balancing your other responsibilities. You can start to make goals for yourself – earning your first leg, earning your first leg with a rabbit you produced, earning a senior leg, granding a rabbit, etc. The biggest lesson to learn in this stage is to lose your fear of being stuck with rabbits. You will want to keep your bunnies for several months before deciding which to cull. It is great advice to keep your first litter from a particular line until adulthood. Becoming very familiar with what you are working with, and especially how it matures, should be one of your goals. For The Experienced: Probably the majority of you who are reading this have already been through these steps. Perhaps it was a walk down memory lane. Perhaps you wish someone had told you these things when you got started. If you have advice to add, don’t hesitate to add a comment. You can help me help those who are just getting started in the wonderful world of Holland Lops! Next Article: Can one rabbit make all the difference in your herd?